Executive Chef Dakota Weiss has elevated comfort food at W Los Angeles – Westwood since she joined the hotel’s restaurants, managed by Choice Hospitality Group. She creates farmers’ market-driven, modern American cuisine at NINETHIRTY and creative California cuisine at The Backyard. As a Bravo “Top Chef Texas” competitor, her philosophy to cooking is one main ingredient: fun. I joined a group of discerning foodies one night to experience some fun tasting her signature dishes at NINETHIRTY. We had a lively good time nibbling on her signature potato puffs in a decadent black truffle fondue with tiny pieces of lardons and fresh chives. “I’ll take favorite dishes and class them up, but I also keep it approachable. I want guests to leave with a warm, fuzzy feeling inside,” Weiss said. Prior to W Los Angeles – Westwood, she worked as an executive chef at Hotel Shangri-La in Santa Monica, Sunset Tower Hotel’s Tower Bar, and Jer-ne at the Ritz-Carlton, Marina Del Rey. Born and raised in Lancaster, California, Weiss’s love for cooking began at a young age when her mother, suspense novelist Charmaine Coimbria, introduced her to the kitchen and organic gardening. She graduated top of her class at Scottsdale Culinary Institute. While working at the Ritz Carlton in Atlanta under the direction of Executive Chef Bruno Menard, she learned to cook not only with her taste buds, but her eyes, nose, and heart. We all raved about the cousa squash carpaccio with crunchy tempura shishito peppers drizzled with a yuzu-pumpkin vinaigrette. If you love zucchini, you’ll enjoy the cousa squash. It’s a smaller, sweeter and a thinner-skinned variety of summer squash. 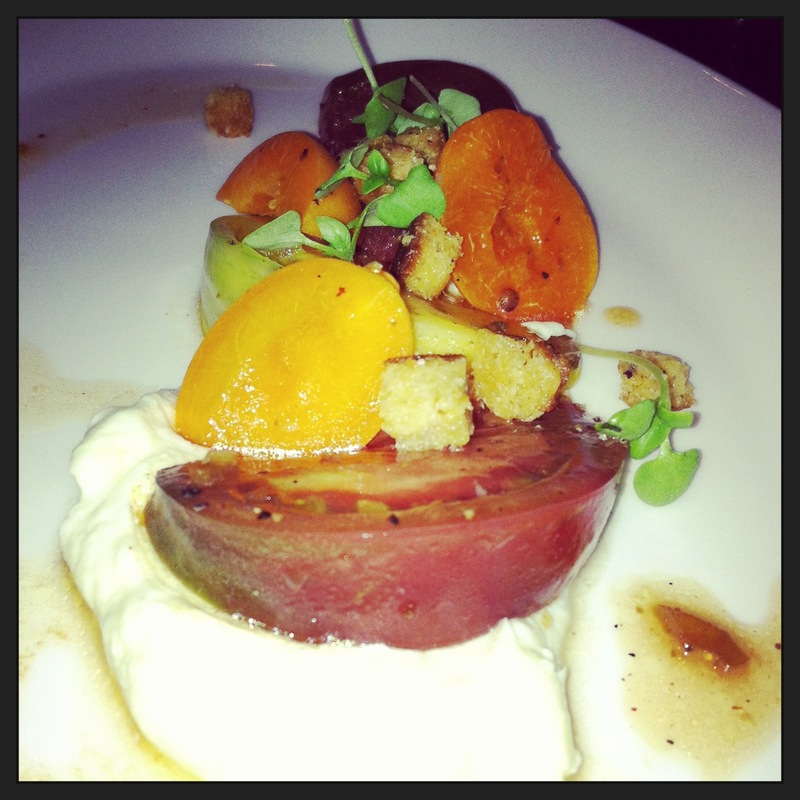 Next, we enjoyed the heirloom tomato salad with sliced apricots and stone fruit salad. Almost every multi-star restaurant is serving burrata in their salads. Chef Weiss makes a delightful ricotta cheese infused with lemon instead. “It’s less salty than burrata,” she added. It cut the acidity of the tomatoes and enhanced the sweetness of the fruit. Her luscious corn soup is mixed with smoked queso fresco and jalapeno pistou. Pistou is basically a pesto sauce, without the pinenuts. It’s made with garlic, fresh basil, and olive oil. “The next dish is a little messy,” Weiss said as she presented the oxtail and bone marrow lettuce wraps. Romaine lettuce is spread with a slightly spicy green Thai vinaigrette of cilantro, jalapenos and crushed cashews. We spooned marrow and tender oxtail meat on a leaf, place a sprig of chocolate mint on top to enhance all of the rich and wonderful flavors and rolled it up. We all had smiles on our faces after the first bite. Our server Derek Caldwell was warm, professional and polite as he delivered each dish. 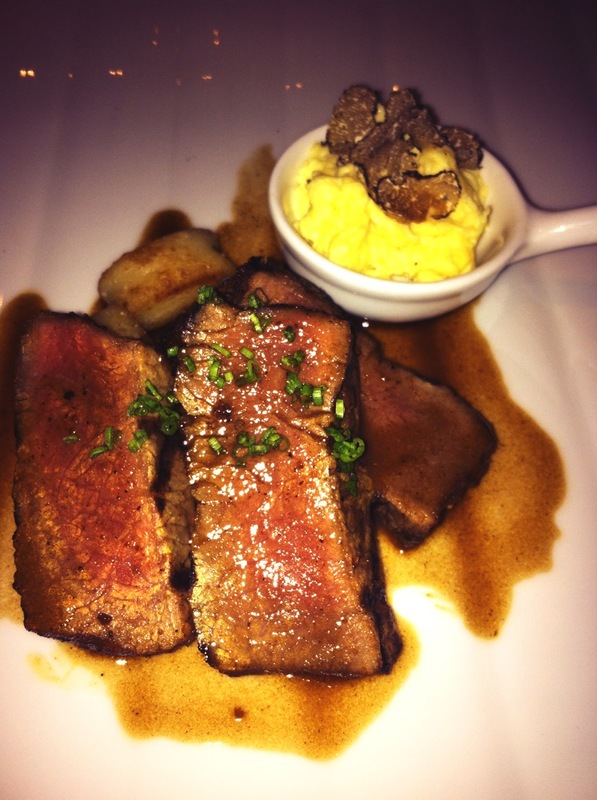 When he delivered the two main courses that included tender halibut with a warm avocado yogurt puree and an excellent cut of steak with soft scrambled eggs topped with shaved black truffles, we all sang out “ooh and aah” with each bite. Just when I was about to bid adieu to the group, a platter of “fun” desserts lured me to stay a while longer. 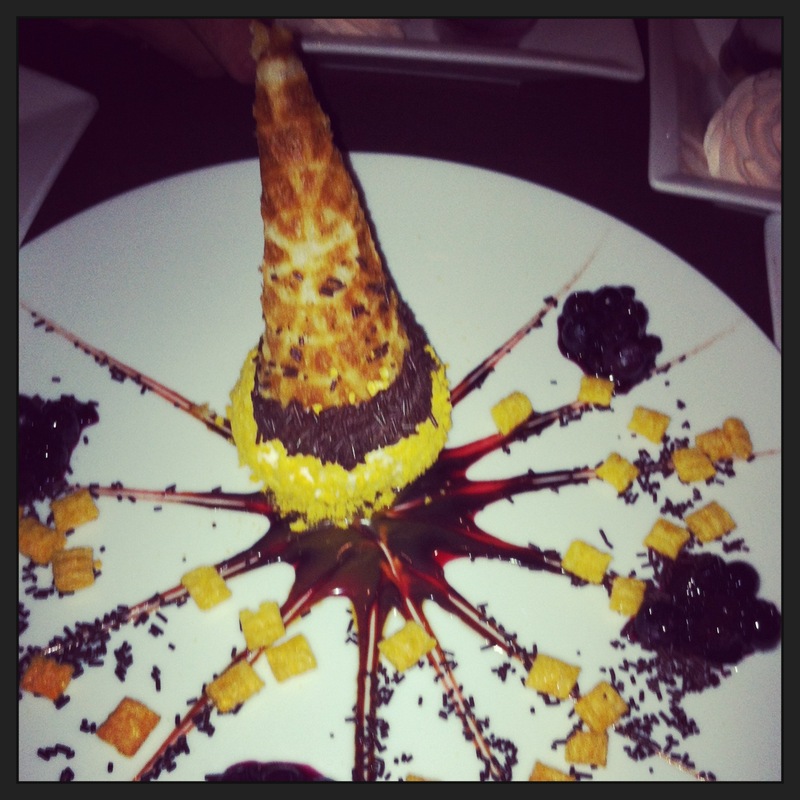 The first to catch my eye was the maple bacon ice cream drumstick surrounded by Captain Crunch and a blueberry compote. I also sampled of the sticky toffee pudding, chocolate lava cake with fresh coconut ice cream and colorful housemade push-pops in berry and crème fraiche flavors. We all left with a parting gift – a box of Dakota’s gourmet popcorn. It had a chipotle, cinnamon and toffee essence with a touch of dark cocoa and toasted sesame seeds. She also sprinkles a little sundried red chile powder from Chimayo, New Mexico. Walking away from the table, I shook hands with the staff and promised that I would come back soon for another fun culinary experience. NINETHIRTY serves breakfast daily; dinner is served Tuesday through Saturday from 5 to 10 p.m. 930 Hilgard Ave. (310)443-8211. Published in the July 1, 2013 issue of the Beverly Press and Park LaBrea News.